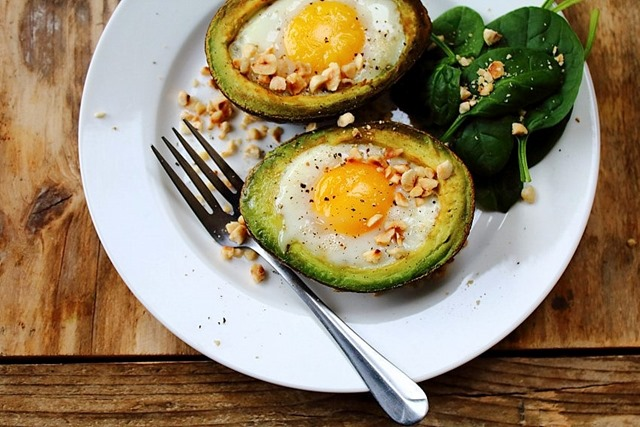 If we assume that the protein fried eggs with its comparatively low insulinogenicity is not a problem (unlike your whey, for example), avocado and eggs fried in olive oil is the perfect breakfast to replace the liquid test meal used in the study. There's no debating that increased amounts of free fatty acids in the blood will impair your insulin sensitivity, as they should be there only, when your supply of carbohydrate is running out, AMPK and with it the expression of lypolytic enzymes increase and the triglycerides from your fat stores are broken down into free fatty acids and released into your bloodstream where they can be used by liver, muscle and other organs as an alternative energy source. Now, the word "alternative" is of paramount importance, here, because you'll find yourself being in (diabetic) trouble if those FFAs pile up on top of high glucose levels. This is what happens with the SAD diet and its high carbohydrate and fat content (and energy!) content. 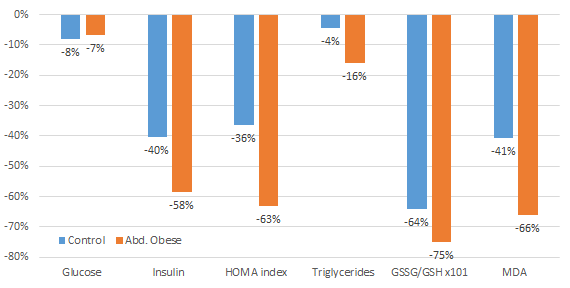 It's a vicious circle: When the levels FFAs are up, insulin sensitivity goes down (after all, with a normal diet you'd have to burn the fat and spare the precious glucose | Bodne. 1997; Koves. 2008). Since there's more and more glucose spilling in over the portal-vein, though, insulin will keep increasing to a point where it does no longer simply impair, but almost block the oxidation of free fatty acids. Now, without insulin working its glucose shuttling magic, however, the cells begin to starve for glucose and... right, more FFAs are being released, the insulin resistance increases, still hardly more glucose is being shuttled into the cells to restore AMP to ATP and the process continues. This quote also contains another important information you will have people with an agenda forget to mention: the subjects in whom the fats worked their magic were abdominally obese! Later on we will see why this is relevant and why the same rules won't apply to lean individuals, but for the time being let's firstly take a look at the exact characteristics of the N = 40 (total) subjects in the study in Table 1. Table 1. General characteristics, fasting lipids and lipoproteins, glucose, insulin and HOMA index values in the studied groups (Martinez-Hervas. 2016); a control vs abdominal obesity group (p<0.01). Even though the discriminating feature, i.e. the characteristic the scientists used to find subjects for the two groups was their waist circumference (>102/88 cm for men and women, respectively vs. <102/88 in the control group), it shouldn't surprise you that the scientists have also observed sign. differences in other anthropometric and metabolic markers such as the BMI, the level of triglycerides, blood lipids and postprandial glucose levels after an oral glucose tolerance test (OGTT | see Table 1). Is it a problem that the male / female ratio differed? That is difficult to tell. We do know that men and women handle nutrients, esp. fat and carbs slightly differently, but I doubt that the difference between an 11/9 ratio in the control group and a 7/13 ratio in the abdominal obesity group will ruin the results of the study at hand. Nevertheless, this should be addressed in future studies. "[...] 125 ml contains 60 g fat, of which 12 g are saturated, 35.35 g are monounsaturated, and 12.75 g are polyunsaturated. Each 100 ml contains <1 g lauric acid, <1 g myristic acid, 4.8 g palmitic acid, 1.4 g stearic acid, 27.7 g oleic acid, 9.6 g linoleic acid, 1.4 g behenic acid, and 0.5 g lignoceric acid" (Fernández‐Real). The detailed fatty acid composition of the SFAs, MUFAs and PUFAs emulsion that was administered at a dosage of 50 g fat per m² of body surface (calculate your body surface if you want to know your individual equivalent dose = result of your calculation in m² x 50g g/m²; e.g. 1.78 m² x 50 g/m² = 89 g of fat) at 8:30 after an overnight fast is not mentioned in the Martinez-Hervas study. What the authors of the study at hand tell us, however is that the likewise relevant ratio ω6/ω3 is > 20/1 - similar to the average diet, by the way; a fact that excludes that this is an omega-3 effect we are seeing, here. Similarly, exercise or previous meals, shouldn't have messed with the results, either. After all, in both groups, only water was permitted during the "eating" or rather "drinking" process, and no physical exercise was undertaken before or during the "fasted" fat loading test in the AM. PUFA Increases Postprandial Thermo-genesis in Women & Beyond - 14% Increase Over MUFA & SFA Sounds Huge, But Does it Matter? Insulin: In contrast to what you will see if you co-administer fat and carbohydrates (learn more), the administration of the high MUFA + PUFA fat supplement in the absence of carbohydrates lead to a sign. reduction of the initially 3.8-fold increased insulin levels. Not to normal levels, but at least to 158% (i.e. 1.6-fold elevated) of the fasted value of the lean subjects. Ah, but remember: All that happened with the fat load, alone, and in the absence of CHOs. In the presence of carbs the results would have been much different. GSSG/GSH ratio: The effects on the ratio of 'used' glutathione (GSSG) to the amount of the 'fresh' master anti-oxidant (GSH) were quasi the opposite of what the scientists observed for insulin. Here, the abdominally obese group had 2.4x elevated levels to begin with. This tells you that, compared to the normal controls, their anti-oxidant status was a mess. After only 8h, however, their GSSG/GSH ratio had not just declined, it was actually lower than the fasted value of the control group. And again, likewise similar to the effects on insulin, the control group saw benefits as well, with a 64% decrease in the GSSG/GSH ratio their antioxidant defenses did also benefit from the MUFA + PUFA load in the AM. "[O]ur study has demonstrated a significant reduction of postprandial glycemia, insulinemia, c-peptide and oxidative stress markers using an acute oral overload of unsaturated fat. We have found a significant correlation between oxidative stress markers and postprandial lipemia. There is an increase of TG achieving the maximum peak four hours after the beginning of the test. However, although postprandial lipemia has been implicated in the development of insulin resistance and oxidative stress, and despite the increase of TG, there are significant reductions of the HOMA index and oxidative stress markers" (Martinez-Hervas). Even though you may think otherwise, the authors are also right, when they point out that "[t]he influence of dietary macronutrients in insulin sensitivity is not well known" (ibid.) This is especially true, when we begin mixing proteins, carbohydrates and fats and start to take into consideration that we can have a dozen of types of the three in a single meal. What about me? I am not abdominally obese, will I benefit, too? If we assume that you deprive yourself of any carbohydrates (and proteins? ), you should see the same benefits as the subjects in the control group - those are lower than what we see in the big belly group and may simply be a result of the moderate energy intake (that's < 900kcal before an 8h fast even for many bigger guys), it would appear as if the answer to your rightly asked question would be "Yes, you can benefit, as well." 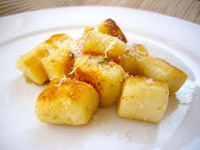 Whether this will also require you to abstain from all, not just insulinogenic dairy proteins, however, will have to be tested in future studies. "Iggman et al demonstrated in elderly men that palmitic acid, the major saturated fatty acid found in adipose tissue, inversely correlates to insulin sensitivity measured by euglucemic-hyperinsulinemic clamp. However, they also found a positive relation of insulin sensitivity with the content of linoleic acid in adipose tissue (Iggman. 2010). It is in accordance with our results because our commercial liquid preparation of high-fat meal of long chain triglycerides is composed in the majority by linoleic acid (59%). Furthermore, in line with our findings, the replacements of dietary saturated fat by unsaturated fat also improved fasting insulin sensitivity (Vessby. 2001). Several other studies have demonstrated that unsaturated fat improves fasting and postprandial IR, although the mechanism is largely unknown (Wang. 2015). Moreover the PREDIMED study has recently demonstrated that unsaturated fat can improve fasting insulin sensitivity and prevent the incidence of type 2 diabetes (Salas-Salvadó. 2011). Another thing the study could not address is the chicken or egg question: After all, you can argue athat the significant reduction in oxidative stress markers the scientists throughout the fat load test could - as a result - have improved the subjects insulin sensitivity, but - at least in theory - it is imaginable that this worked the other way around... by an unknown feedback loop. Figure 2: Relative in-group reduction in the parameters from Figure 1 from 0h to 8h (Martinez-Hervas); in contrast to the previous figure the one at hand shows the in-group difference, i.e. the change in control at 0 vs 8h, etc. As you see, there's still lots to be learned about dietary fat out there - including the fact that a "high fat" diet that combines high energy with high fat and high carbohydrate intakes is always detrimental for your health and should no longer be used in studies, unless the goal is to mimic the Western diet (and I beg scientists to then call it what it is, and that's not a "HFD"). Beware of dairy proteins, especially whey, but also casein are highly insolinogenic and may reduce if not reverse the effects of fat loading in the AM on glucose management and inflammation | learn more. Bottom line: Before you get addicted to the previously suggested avocado + eggs fried in olive oil breakfast, please keep in mind that this is not what the scientists tested. Especially in view of the relatively high protein level in eggs, another study would have to make sure that the latter won't interfere with the benefits... even if that's much less likely for eggs, meat or fish than for the highly insulinogenic dairy proteins. Furthermore, the study at hand cannot tell us anything about the long-term effects, because it is an acute intervention (not even lasting for 24h, there could have been a rebound at 12h or 24h or with the ingestion of another meal at noon, etc.) that suffers from another methodological problem. Without a control supplement containing high(er) amounts of saturated fat, the assumption that the results were MUFA + PUFA specific is simply based on the scientists' review of the existing research (see previous elaborations + quotes). And as the scientists add, last- and [f]inally, oxidative stress markers analyzed could be also altered by others players regulating the postprandial state" (Martinez-Hervas. 2016) | Leave a comment, praise or criticism on Facebook! Boden, Guenther. "Role of fatty acids in the pathogenesis of insulin resistance and NIDDM." Diabetes 46.1 (1997): 3-10. Borkman, Mark, et al. "The relation between insulin sensitivity and the fatty-acid composition of skeletal-muscle phospholipids." New England Journal of Medicine 328.4 (1993): 238-244. Fernández‐Real, José M., et al. "Fat overload induces changes in circulating lactoferrin that are associated with postprandial lipemia and oxidative stress in severely obese subjects." Obesity 18.3 (2010): 482-488. Iggman, David, et al. "Adipose tissue fatty acids and insulin sensitivity in elderly men." Diabetologia 53.5 (2010): 850-857. Koves, Timothy R., et al. "Mitochondrial overload and incomplete fatty acid oxidation contribute to skeletal muscle insulin resistance." Cell metabolism 7.1 (2008): 45-56. Martinez-Hervas, Sergio, et al. "Unsaturated Oral Fat Load Test Improves Glycemia, Insulinemia and Oxidative Stress Status in Nondiabetic Subjects with Abdominal Obesity." PloS one 11.8 (2016): e0161400. Vessby, Bengt, et al. "Substituting dietary saturated for monounsaturated fat impairs insulin sensitivity in healthy men and women: The KANWU Study." Diabetologia 44.3 (2001): 312-319.